The goal of this page is to present an illustrated list of Roman Emperors. While I was in Rome In July of 1995 the idea for this page hit me at some point in the Vatican museum. I had seen lists of emperors on the net and I figured these lists would be much more interesting if they had pictures as well. Thus, I tried to snap pics of as many emperors as I could find in various museums. Anyway, what follows is a list of the Roman emperors and whenever possible, their busts and/or any other contributions they made to Roman art or architecture. Click on the emperor's name to see his coin portrait. This list is now essentially complete with respect to my trip to Italy last July (if I had my good camera when I was in Boston last month I could have gotten a few more from Harvard's Sackler gallery - doh! ), and you can see I'm missing quite a few emperors. 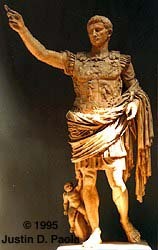 If anyone out there has pictures of sculpture portraits for any emperors I do not have, I would love to have an electronic copy to post to this site. I will provide appropriate acknowledgements and sufficiently shrink and JPEG each image so that it is not posted in publication quality. I will also tag it with your name if desired (like in my pics). All sculpture photos are Copyright 1995 Justin D. Paola. Please acknowledge any re-use of these photos. All of the original photos on this page are for sale as well. See this page for details. Essentially, I'll sell you an 8x10 of any of these pictures for $12 plus shipping and handling. Last update July 7, 1996. Yes, YOU can help me identify these miscellaneous Roman emperors. The majority of sculptures in most of the museums were stacked on shelves and utterly lacking in documentation. Others were labeled and I simply forgot. The following batch are all from the Vatican museum. Help me identify these suckers. Prizes are negotiable. And the shakiest one of all, a full-sized female statue in the Vatican museum that I have very tentatively identified as Sabina, Hadrian's empress. A glimpse of his stadium. Return to Justin's home page.